Sometimes a company starts out knowing exactly what they want to sell and they stick with it, but more often companies evolve with time. One such company that made a change is Currey & Company. Beginning life as Garden Source Furnishings, the company soon realized that the lighting category was its most important, and expanded to reflect this. Today chandeliers and wall sconces make up a significant part of the company’s business. Since they’re this week’s spotlight, let’s give Currey & Company a closer look. Founded in Atlanta, Georgia in 1988, Currey & Company started out as a purveyor of historic garden furnishings. The main focus of the company was the creation and marketing of classic garden furniture from the Winterthur Museum and the Smithsonian Institution, interspersed with a collection of garden whimsies, birdhouses and rustic twig furniture. By the 1990s the company expanded to include a large selection of lighting for which they’re now best known. While hand forged iron products has been a specialty of the company, their range includes a variety of materials such as hand-carved wood, porcelain and brass. They have also started an international branch of the company that’s run out of the Philippines. Currey International focuses on handmade products with seashells and other natural materials featuring prominently. Since their company has its origins in garden decor, Currey & Company lighting has an organic, natural appeal. Since it’s made by hand their products have a sense of rustic durability. 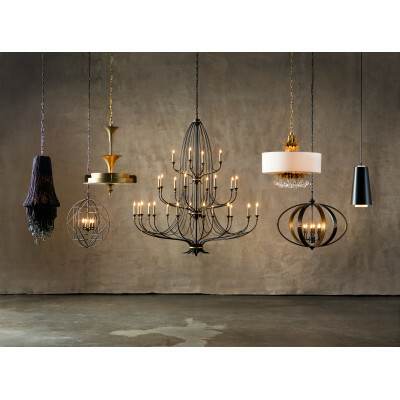 With lighting that ranges the style gamut, Currey & Company features both classic chandeliers made of hand-forged iron as well as elegant porcelain table lamps, all embodying a sense of warmth and charm. Their pieces also have an air of the imperfect, reflecting their unique origins.